Based in the Riverland of South Australia, Lucy Clements is Group Commercial Winemaker for Accolade Wines with responsibility for Accolade’s value and mainstream wine portfolio, which accounts for the majority of the company’s Australian production. 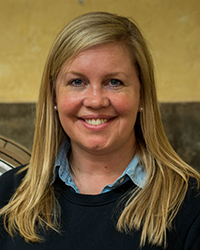 Lucy graduated from the University of Adelaide with a Bachelor of Agricultural Science, Oenology, in 2002 and has made wine in France, USA, UK and Australia across 14 vintages. Lucy spent seven years in the UK in various roles as product developer, winemaker and wine buyer for Waverley, Sainsbury’s and Tesco for myriad wine regions around the world. In 2015 she returned to Australia as Head of Wine Sourcing at Coles Liquor and then returned to full-time winemaking in 2016 at Accolade. Lucy is also half-way through her Master of Wine qualification. Lucy will address Managing climate risk in a wine business on Monday in Session 4.